The World We Live In is about 19 characters of all different age groups from young child to grown adult who all go through various experiences in their lives. They chronicle their life through poetry prose and share their pains and sorrows as they strive to become better people in a tough world. Have you ever considered 19 different ways of looking at the world? Take a look at life from a different point of view with myself and author Jamell Crouthers, as we discuss the poetry of The World We Live: A Poetry Book On Societal Issues. Jamell, what inspired you to write a poetry book that shares such a wide range of viewpoints? This book started from seeing the world and all that is going on. There are so many societal issues that are going on around us, we fail to take the time to discuss these things more. Some examples are homelessness, drug addiction, alcohol addiction, depression, child abuse and so many more things. Were you drawn to exploring these societial issues because they had directly impacted your life? It was mostly other people’s life experiences, seeing the world and what’s going on around us. I listen to a lot, watching what’s going on and knowing that so many things need to be discussed. This is about sharing powerful stories that will hopefully get the reader to emote or relate to these characters in some way, shape or form. These powerful stories carry such emotion that I would imagine that they are also highly emotional to write. Looking back, do you feel that tackling these deep emotions helped energise your writing, or did it get a little overwhelming? Writing always energizes me, especially when I have music and I get into a zone. When I’m focused, I can write for a good 2 hours straight without any breaks. I love that you can get into the zone and spend so much time with your characters. Tell us a little more about them, and how they’ve evolved with the stories? The characters came to me through a lot of brainstorming and spending time crafting a story to tell but also having a backstory to tell too. Everyone has a back story that got them to the place that they’re in. Experiences shape who we are in a lot of ways and I wanted to bring these characters to life through my writing and poetry I felt was the best way to do it. Did you find yourself focusing your mind on these backstories and experiences as you wrote? No, there’s nothing necessarily on my mind when I’m writing. I always have to write with a clear head and be focused on writing characters and bringing them to life as if you know them personally in some way. And by knowing them so personally, I’m sure that you learnt a lot about yourself. What was the most important thing that you feel you took away from spending so much time with these 19 points of view? I think I’ve learned that we all are dealing with tough times in our lives and we need to be there for each other. If we don’t take the time to talk to each other instead of being engulfed in our lives, we can’t make the world a better place to live in. Indeed, we do need to try to make the world a little bit better. Yes, I want to let people know that we all go through experiences in our lives but its a matter of how we deal with things and how we cope. The biggest part of writing this series is we all need to be a listening ear and be there for each other no matter what. Sometimes we are all going through things that no one will ever know. By listening to your characters, and of course your writing, have you found that your voice has solidified and become clearer? Do you feel that your voice is brandable for your writing career? That was my goal from the get-go, to build my own author brand. It’s all a work in progress and taking it one day at a time. It’s continuing to tackle subjects that are taboo and I have so many more good books coming in the near future. New books! I always love hearing about more books. What can you tell us about your next writing projects? I just finished writing Kids With Guns 2, that is a series of 5 books that will start in September where it addresses gun control, school safety, bullying and things that are going on in America with gun violence. Awesome, I can see how that new project will build up your author brand and compliment your existing work! With work well underway on Kids With Guns 2, can you see how far your author voice has come since you started to write? Yes. My voice definitely has progressed in so many ways. I’ve been fortunate and blessed to be able to write on a plethora of subjects and even write some books in series. It started with the Struggles and Growth of a Man as my first book, then I ventured into the Code Blue: An Oath to the Badge and Gun series and this current series The World We Live In. All of these series will be finished by the summer and then I will be starting a new series Kids With Guns. I’ve also been able to start my own podcast, write blogs and record my own audiobooks. This is all about trying to change the world one book at a time which is my mantra. Good luck turning that mantra into reality. Jamell, thanks so much for sharing a taste of your view of the world with us, and I can’t wait to hear more about how you’re changing the world one book at a time in the future. Excited to read the book we discussed today? Find it here on Amazon: ‘The World We Live: A Poetry Book On Societal Issues ( ASIN: B01GSARA6M )‘. 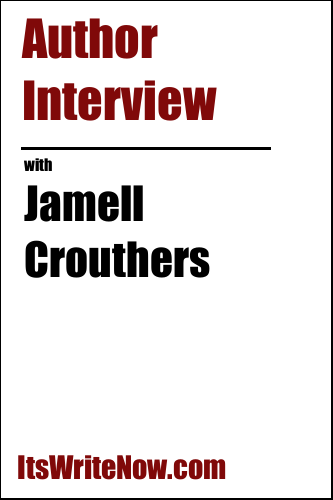 Want to find out more about Jamell Crouthers? Connect here!